In January 2003, Tunbridge Wells Borough Council was awarded £2.1m by the Heritage Lottery Fund to restore Dunorlan Park, the town’s favourite park. Once a private garden, Dunorlan was designed by the Scottish landscape gardener Robert Marnock (1800-1890) for millionaire Henry Reed between 1854-1864. Reed was born in Yorkshire and made his fortune in Tasmania. He was a committed evangelical and friend of William Booth, founder of the Salvation Army. Dunorlan is one of the best-preserved examples of Marnock’s work and contains a number of Pulhamite features, including an ornate Pulhamite and terracotta fountain. The Council commissioned Philip Masters from ACTA to be the Project Manager and ISS Waterers Landscape were contracted to undertake the restoration works. The restoration commenced in September 2003 and practical completion was achieved a year later. The splendid fountain with its dolphins, water nymphs and classical figures is one of the most impressive features of Dunorlan and forms the focal point at the end of a long cedar avenue leading down from the Grecian temple. The fountain bowl is made of Pulhamite and the figures are of terracotta. Pulhamite is a Victorian artificial stone, a material like concrete which can be cast in moulds and resembles natural stone when set. Under the name of ‘The Dunorlan’ the fountain appears in a Pulham catalogue dating from the 1860s. It was also exhibited in 1862 at the Great Exhibition in London. Over time, the fountain had eroded and deteriorated. It is also rumoured that much of the damage to the figures occurred during World War II when soldiers based at Dunorlan House used it for target practice. 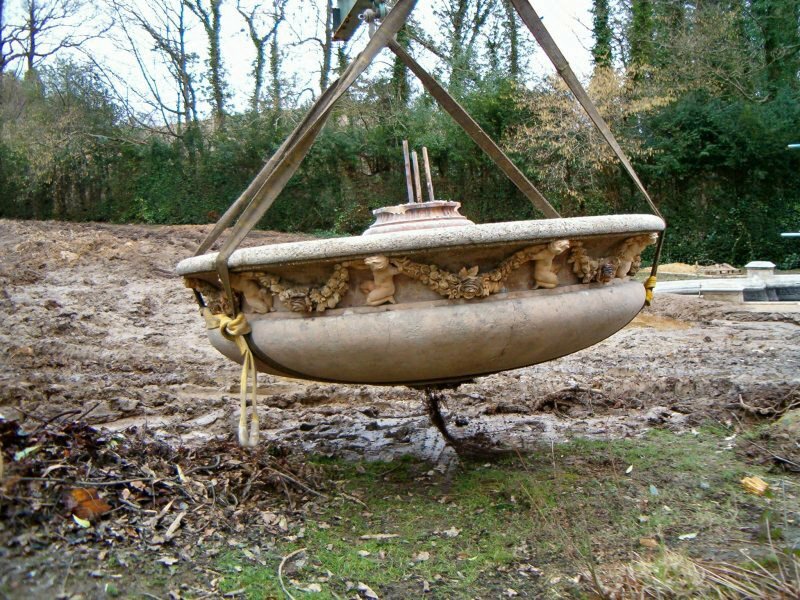 Parts of the figures had been kept safely for some years at Tunbridge Wells Museum, others were found in the silt when the fountain basin was drained. It was a tense moment when the fountain was carefully dismantled by Stonewest Ltd and delicately lifted by a 35 tonne crane to be taken to Shaws of Darwen for repair. 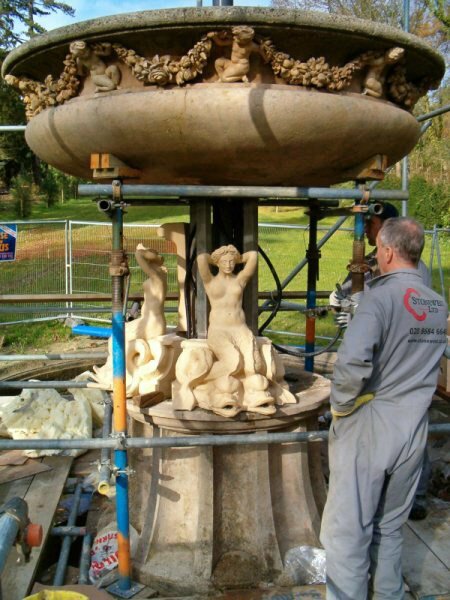 All the Pulhamite elements of the fountain, the pond walls, central base and 3½ tonne lower bowl were cleaned and reunited, but Shaws found that many of the terracotta sections of the fountain were beyond repair and needed to be recast. The items were first sculpted in clay, the sculptures being about 15% oversize to allow for the shrinkage that occurs during drying and firing. Plaster moulds were made of the sculptures and when dry, the moulds were filled with refined clay. The moulds were left overnight so that the terracotta sections could stiffen sufficiently to allow their removal from the moulds. Before firing, all the exposed surfaces were worked to bring finer particles to the surface, improving the appearance and weathering properties by forming a fireskin. When completely dry, the terracotta sections were kiln fired to 1200 degree celsius. Following inspection, Stonewest reassembled the fountain on site. During the curing process terracotta warps and distorts and before the newly sculpted sections could be chemically anchored together, the masons skilfully shaved and shaped them in order to ensure a close fit. The joints were then filled with a colour-matched grout. The restored fountain has a stainless steel structure to support the lower bowl. The terracotta was fixed to the frame and infilled with concrete to stabilise the structure. The ornate central column and top bowl were then installed and the hollow terracotta was filled as the work progressed. The original fountain was gravity fed from the nearby lake, which is at a higher level than the fountain. Whilst the restored fountain is pump fed, the water follows the path of the original water system. The inlet goes through the middle of the fountain and fills the top bowl, the water cascades into the lower bowl from holes in the form of lions’ mouths in the top bowl. From the lower bowl there are eight tubes which take the water back into the structure and then feed it out into the pond through the mouths of the fish on each side of the mermaids. Some parts of the fountain, including dolphins, water nymphs and the statue of Hebe which is at the top of the fountain, are sculpted copies of the originals. The restorers had evidence of how the whole structure once looked, except Hebe’s upper half. The figure of Hebe was based on a statue by Canova. Canova produced four Hebes, each slightly different in style. The sculptors had a side view photo of the version housed in St Petersburg, a front view of another version in France and complete all-round photographs of the Chatsworth version, taken on a pre-arranged visit to Chatsworth House. Hebe was modelled in clay on a steel and aluminium armature. On completion of the modelling, the arms were removed and the body cut in half just above the top of the skirt. Plaster moulds were then taken of the separate pieces. 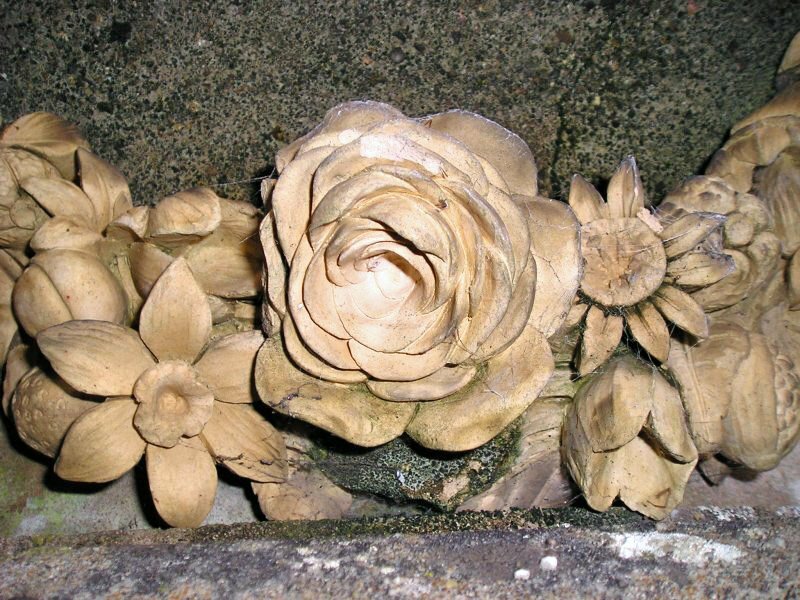 These were then cast at Darwen and the hollow pieces reassembled in clay. 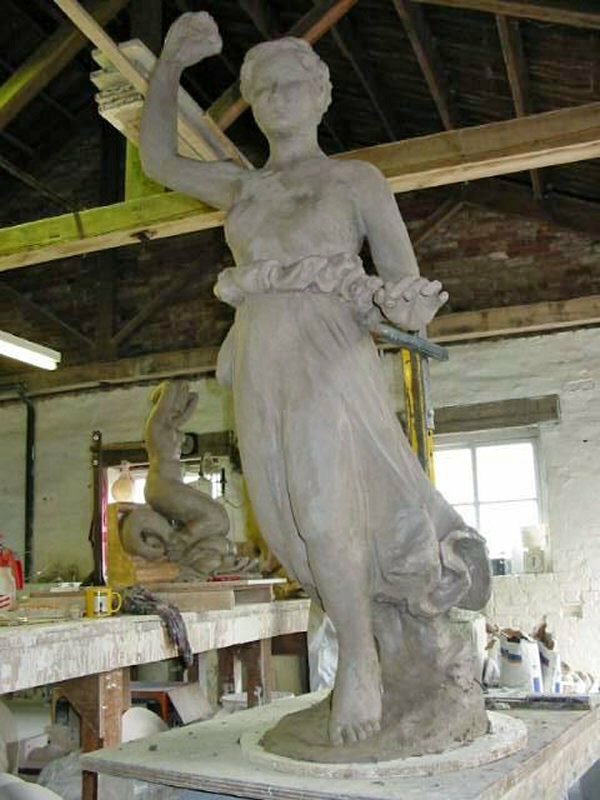 All the original fountain pieces not used during the restoration will be retained, conserved and used for education purposes. ISS Waterers: Peter Steyn, 01344 293400, petersteyn@isswaterers.co.uk.